Peanut butter cookies for breakfast. That's what you get with this bowl. Well, sort've. 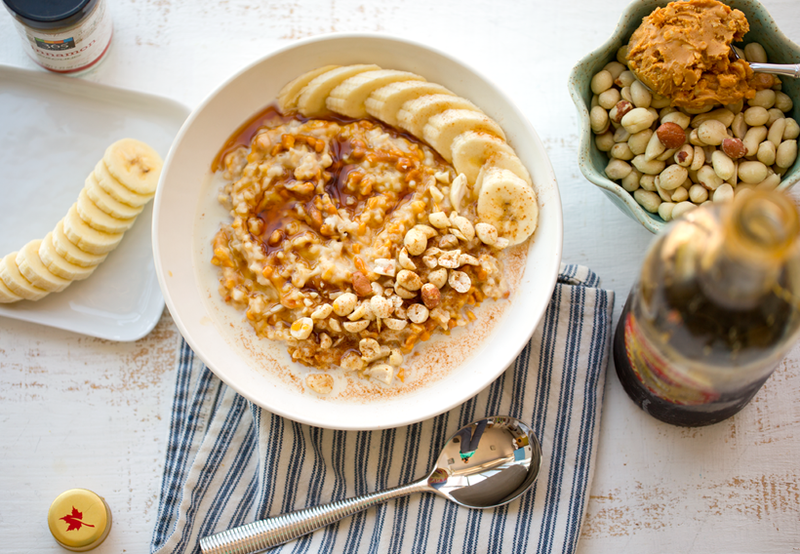 PB&Oats. Peanut butter is one of those comfort foods that immediately calms me and warms my soul. Maybe because it reminds me of childhood. Or maybe because every spoonful is just so delicious and perfect, just as it is. 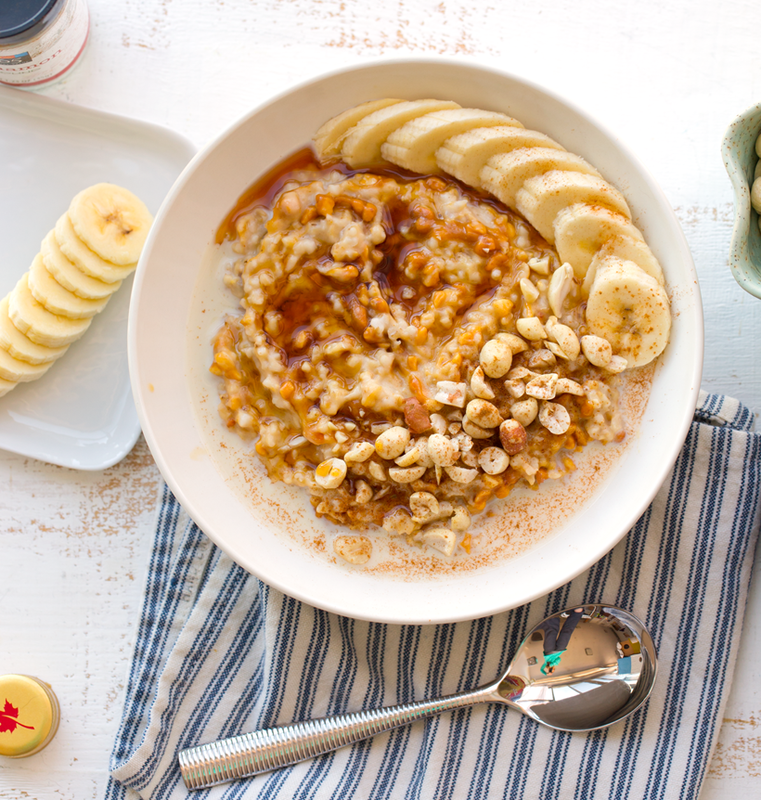 This oatmeal is loaded with rich peanut butter, a hint of cinnamon and banana and some maple syrup for sweetness, this bowl really does taste like a cozy big bowl of dessert. But it is loaded with fiber, potassium and it is a good source of protein and healthy fats too. 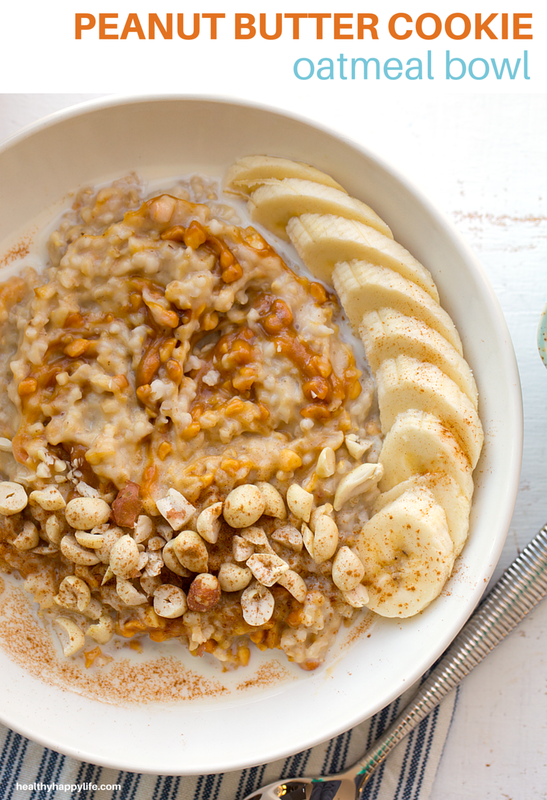 I love this go-to oatmeal bowl for some comfort food in the morning. And you could even go one step further towards oatmeal dessert bliss and pile on some vegan chocolate chips. Watch them melt into the steamy warm bowl and mingle in pure peanut butter cup perfection. Or add some goodness to your pb bowl by loading on some fresh or frozen berries. I love raspberries or homemade strawberry jam with these oats! 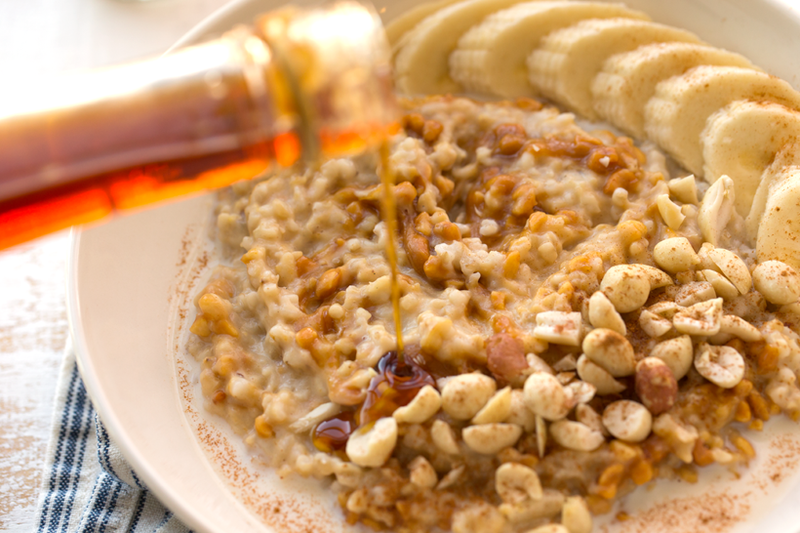 Or just as it is, simple and sweet, this bowl of oats is a favorite of mine. 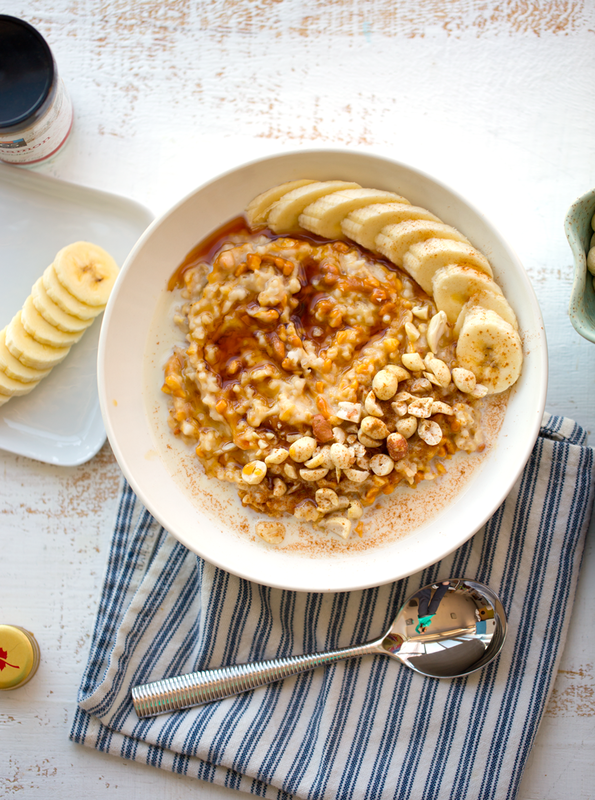 This rich and creamy peanut butter oatmeal has sweet maple, banana, cinnamon and non-dairy milk swirled in. So decadent you will not believe this is good for you! Make your oatmeal first. In a large pot add the 4 cups of water and 1 cup of oats and salt. Bring to a boil over high heat, then cover with lid and reduce heat to low. Cook for 15-20 minutes or until the oats are fluffy and creamy. Sometimes I will add an extra splash of water to my oats. TIP: I usually double this amount and save the leftovers for the next day. 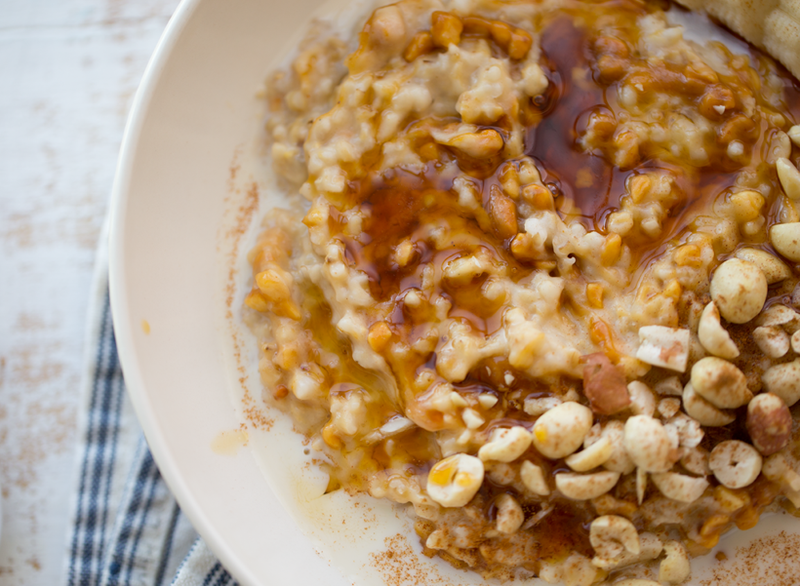 Steel cut oats can be great to make in big batches and reheat as needed. Add the 1/2 cup of peanut butter, optional vanilla and 2 Tbsp of the maple syrup to a small bowl. 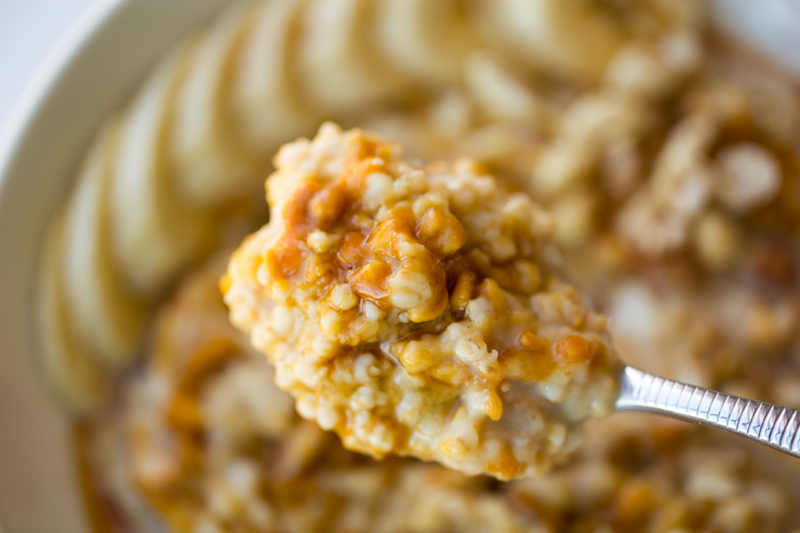 Warm in the microwave for 30 seconds, then briskly stir them together to get a soft, melted sweet peanut butter. Note: If you do not want to use your microwave, you can do this in a small pot on the stove -- or simple stir both into your warm oatmeal in the big pot. Stir half of the melted peanut butter mixture right into the oatmeal - just a light swirl in, it doesn't have to be completely dissolved. 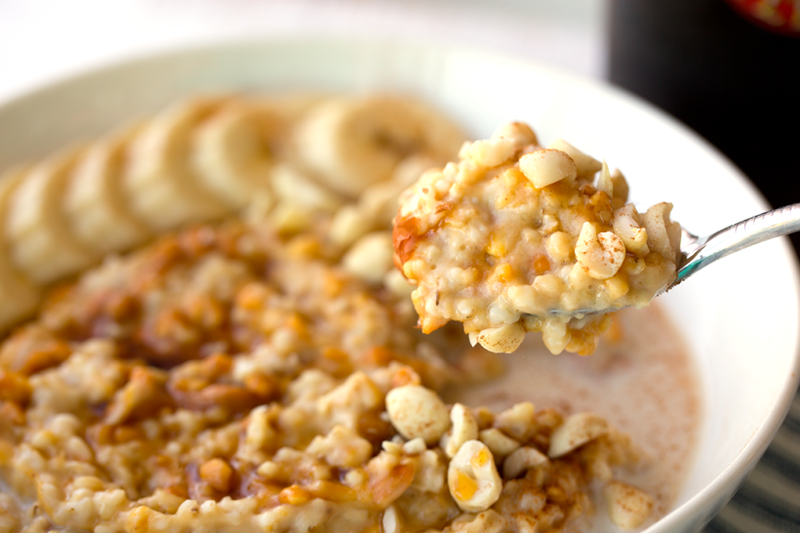 Scoop oats into your serving bowls. Swirl the remaining peanut butter mixture over top the oats as desired. Sprinkle each serving with cinnamon and add chopped peanuts and sliced banana. Add a splash of the warmed non-dairy milk to taste. You can also drizzle additional maple syrup over top to serve. All the toppings can be added to taste. Serve warm. Save leftovers in the fridge and reheat to serve.